O Janardana, O Kesava, why do You urge me to engage in this ghastly warfare, if You think that intelligence is better than fruitive work? 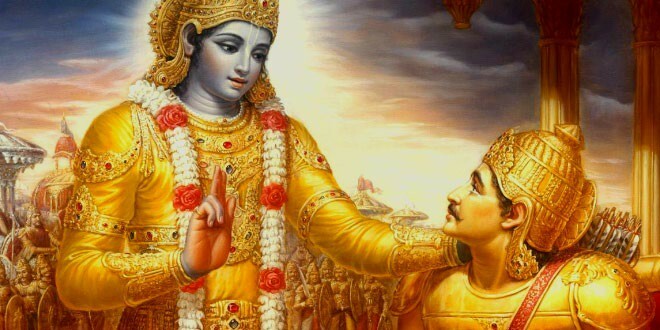 The Supreme Personality of Godhead Sri Krsna has very elaborately described the constitution of the soul in the previous chapter, with a view to deliver His intimate friend Arjuna from the ocean of material grief. And the path of realization has been recommended: buddhi-yoga, or Krsna consciousness. Sometimes Krsna consciousness is misunderstood to be inertia, and one with such a misunderstanding often withdraws to a secluded place to become fully Krsna conscious by chanting the holy name of Lord Krsna. But without being trained in the philosophy of Krsna consciousness, it is not advisable to chant the holy name of Krsna in a secluded place, where one may acquire only cheap adoration from the innocent public. Arjuna also thought of Krsna consciousness or buddhi-yoga, or intelligence in spiritual advancement of knowledge, as something like retirement from active life and the practice of penance and austerity at a secluded place. In other words, he wanted to skillfully avoid the fighting by using Krsna consciousness as an excuse. But as a sincere student, he placed the matter before his master and questioned Krsna as to his best course of action. In answer, Lord Krsna elaborately explained karma-yoga, or work in Krsna consciousness, in this Third Chapter.